Hope you all enjoy, and if so, give a newbie some Karma! Congrats on the healthy lifestyle improvement! wow, this is nice any more? Thanks for the kind words. We must have taken hundreds and hundred of pictures over the last 8 months, we try to take some every week to track progress. 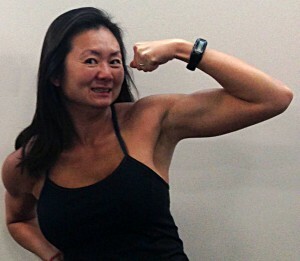 She's gained over 2" in her arms (from 9.75" to 12"), and has lost 8% bodyfat. 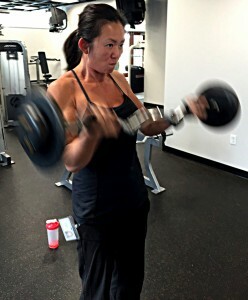 Even with the bodyfat loss, she still gained 15 lbs. Although I've gained a bunch too, percentage wise she's beating me. I don't want to post too many more of the past pictures, but I will try to update this thread once a month or so with her progress. I'm really very proud of her hard work and dedication. We look forward to our workouts together. Congratulations ! Sticking to long enough to results is half the battle! My only advice to you is to continue the positive reinforcement... It works wonders. Way to go to you and your bride! Here's one from last week. The picture on the left is from January, the one on the right from last week. She gained 20 lbs in that time. We just passed the one year mark of us lifting heavy. 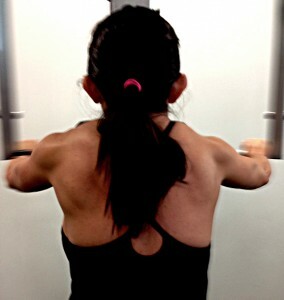 Her arms are now as big as mine were before I started lifting. She's still going strong! Some new pictures, first one relaxed, second one flexing. We spent Easter morning where we should, in the gym! Today is 59 weeks since she started. Picture on the left is week 35, picture on the right is week 59, this morning. 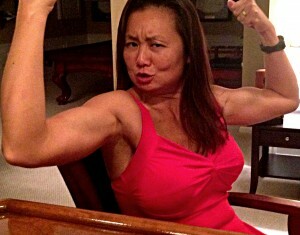 She said she really didn't see much of a difference, but I told her she's crazy, muscles are popping out everywhere. 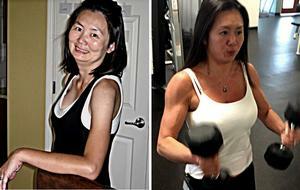 On the left she is curling a 30lb barbell, on the right, two 20lb dumbbells. 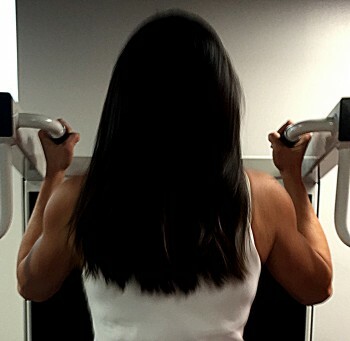 She does 3 sets of 15 reps with them as part of her routine. Almost 61 Weeks now. She did 25 (guy) push ups last night! You're blessed, dude. Your wife is making great, steady gains. She looks younger, sexier and more confident. Her body is slamming, but I'd add that she actually is even prettier as her face is more youthful and healthy-looking. Thanks for the nice comment bicepboy. You know I never really thought about it until you said it, but you're right. She is looking much younger and thinner in her face. Even though she has gained over 20 lbs, she lost a lot of fat. This side by side picture really shows it. Again, thanks everyone, we're going to keep pushing on! Karma please if you like what you see.